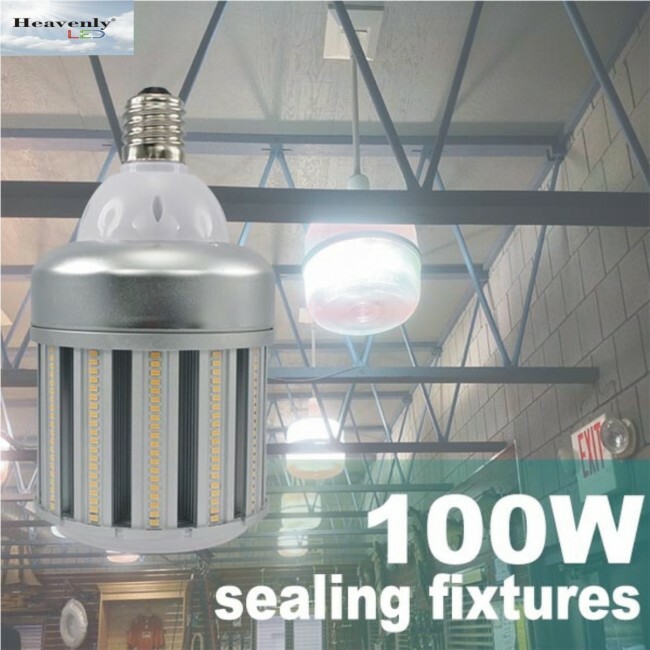 Heavenly LED CORN BULB LAMP have a 360 degree beam angle and the screw-in E39 mogul base mounting easily integrates energy saving LED technology into your standard site lighting, roadway or post top lighting format. This LED lighting retrofit has a polycarbon tube bulb and a polycarbon base. The physical dimensions of the Light Efficient Design LED 6000K Daylight LED retrofit are 11.93inch high by 4.92inch wide. These non-dimmable LED retrofit bulbs carry a 3 Year Limited Warranty. Our 100 watt LED lamp has been designed to retrofit existing HPS installations, thereby reducing maintenance and energy expenditures in residential, commercial, retail displays, hotel, motel and resort applications and as an energy saving light source for new fixtures and installations. Please NOTE: When retrofitting LED to an HID fixture, the ballast must be by-passed or removed from the fixture. Additionally, by-passing the ballast will insure no RFI interference.